In America's most segregated city, some communities live with security, others in constant fear of violent crime. After hearing about the Chicago shooting last week in which 13 were injured in Cornell Square Park, including a three-year-old, I and writer Mikki Kendall, both Chicago residents, had very different reactions. It’s "not just the park incident," Kendall told me by email. "20 people were shot this weekend. People are being shot almost daily. And I have a 14 year-old son who can't go to the McDonald's in Hyde Park at lunch because the school has noticed an uptick in crime at that location." I was depressed and horrified, too — but depressed and horrified in the way that you are when you hear about gun violence anywhere. Unlike Kendall, I wasn't directly concerned about the safety of my family. Based on our reactions, you'd think that Kendall lived much closer to the shooting than I do. But that's not the case. In fact, we're both in Hyde Park, about 4 miles away from where it occurred on the city's South Side. I can walk to the McDonald's she mentioned. So why does Kendall feel personally targeted and I don't? Well, Kendall is black and grew up here; I'm white, and didn't. In other words, welcome to Chicago, where segregation is almost a civic art form. Redlining has had a massive impact on the city, which despite improvements remains the most segregated in the nation. Segregation is so ingrained, and so much taken for granted, that people, or at least white people, don't even notice it. A couple months ago, for example, Chicago Tribune columnist Eric Zorn wrote an editorial in which he argued that, based on murders by population, Chicago isn't actually all that violent a city. And he's sort of right. Chicago can be thought of as a bunch of different cities, and some of them are quite safe. Unfortunately, some of them aren't. And a lot of effort goes into making sure that the folks who have to live in the less safe parts of Chicago don't trouble the sleep of the folks in the safe areas. Hyde Park, the neighborhood around the University of Chicago where Kendall and I live, is a particularly instructive example. Way back in 1952, the wife of a University of Chicago faculty member was assaulted near campus. The university was stung into action, and began to invest heavily in a private security force. It also pushed for urban renewal, in some cases using private police officers to investigate criminal activity in given buildings in order to get the property foreclosed and torn down. Today, the UCPD is, as the university told me in a statement, "a highly professional police force," and one of the largest private security forces in the country. Hyde Park "remains one of the safest neighborhoods in the city," according to the statement sent to me by the University, and, "All of the neighborhoods patrolled by the University of Chicago benefit from the extra service." Meanwhile, our neighbors nearby continue to get shot, and the university hospital, which does have a pediatric trauma unit, ceased providing trauma care for adults in 1988. 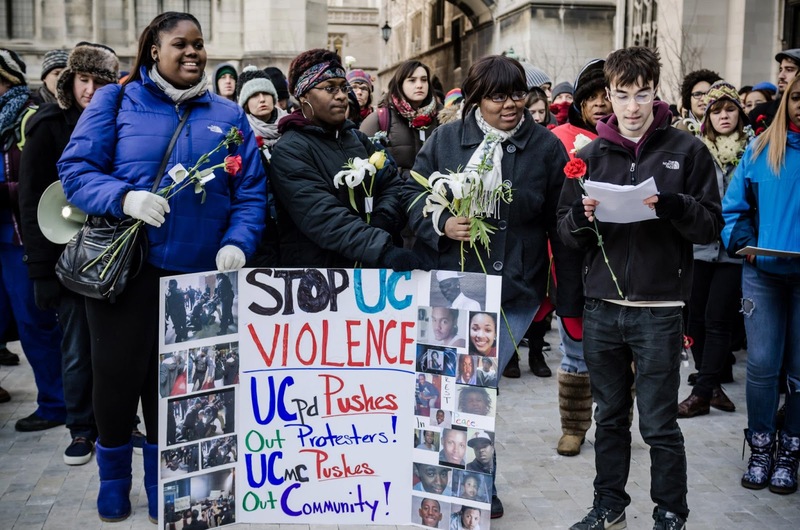 In fact, in January of this year, the UCPD got some unfavorable press for having allegedly shoved around protestors at the university’s hospital who were demanding an adult trauma center for the South Side. Then, in March of this year, a plainclothes officer from the UCPD was discovered trying to infiltrate another protest. In the first case, an independent report exonerated the UPCD of wrongdoing, and in the second placed blame on a commanding officer who was fired. Nonetheless, the multiple police forces in Hyde Park don't necessarily make Kendall feel safer. Instead, as she said to me, they seem to "give a false sense of security to white people, and act as a threat to POC [people of color] who live in the area." Kendall was more distressed than me because she's been in the neighborhood long enough to feel at a gut level that "the little bubble of gentrification that U of C is trying to create isn't bullet-proof." And she's also more distressed because, despite CPD and UCPD insistence to the contrary, from her perspective as someone who's lived all over the South Side, that bubble is in part constructed by policing 14-year-old black boys like her son. Illinois governor Pat Quinn has recently been talking about sending in the National Guard to prevent violence on the South Side, a solution that one can easily imagine leading to new problems, given the troops’ inexperience with urban policing. It’s also tough for some South Siders to take the gesture of concern seriously in the face of what has felt, this year, like a policy of systematic neglect. This year Mayor Rahm Emanuel closed dozens of schools on the city's south and west sides with little community input. There have been concerns about students from the closed schools having to cross gang territory, and about the effectiveness of the mayor's Safe Passage program. Wages for workers in the program are low, and high turnover seems both likely and potentially dangerous. Moreover, the extent of the city's commitment to the program is unclear. As CPS parent and education activist Cassie Creswell told me, "My biggest concern about the Safe Passage program is how long is the city really going to have people out there stationed on these routes? All school year?" The closed schools Bontemps Elementary and Parkman Elementary are both within two miles of Cornell Square Park, where the shootings took place last week. Dyett High School, which is between the shootings and my house, is still open, but has undergone years of cuts and malevolent bureaucratic tinkering. According to University of Illinois-Chicago's Collaborative for Equity and Justice in Education, Dyett was converted from a middle school to a high school in 1999, but was given no high school resources. "On opening day, there were just seven books in the library." In more recent years, Chicago Public Schools cut funds for a college preparatory program, a truancy prevention program, Saturday school, and a reading program. Parents at Dyett had to do their own fundraisers to improve athletic facilities and found enrichment programs, only to see their efforts constantly undermined by CPS budget and personnel cuts. Other schools on the south and west side have been forced to conduct fund drives in order to buy toilet paper. Admittedly, Chicago has serious budget issues. But somehow the money always seems to come out of the hides of the same areas, while other, better-connected communities and institutions have funds shamelessly shovelled their way. You can't disinvest in a neighborhood's institutions and then be surprised when you end up with anger and despair. If our governor wants to put funds into Chicago's South Side, why not put more toilet paper in our schools rather than more guns on the streets? The University of Chicago has some innovative programs to combat violence on the South Side, but a trauma center is still needed down here; if the University of Chicago wants to make the neighborhood safer, why not invest in that to help folks rather than in more cops to arrest them? And if Mayor Rahm Emanuel wants to show that he cares about his city, maybe he could abandon that sports arena that we don't actually need, and instead open back up some of those schools that we do. Because as long as Chicago is determined to be two cities, at least one of them will be violent.